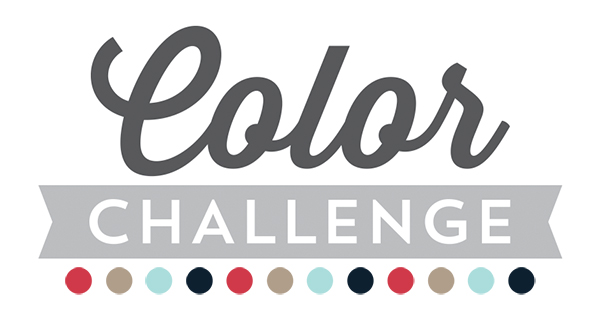 February always seems to fly by, but before we get our March on, it's time for another MFT Color Challenge! This color combination is a whiff of blooming spring — Brown Paper Bag, Lemon Chiffon, Lavender Fields, and Green Room. 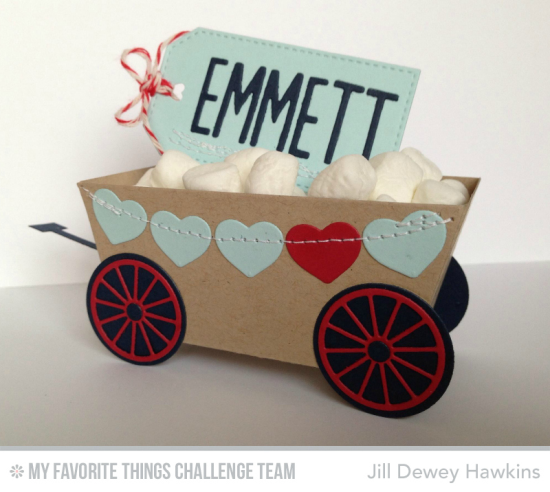 Let's take a creative journey with the MFT Challenge & Inspiration Team and see how they used this color scheme. 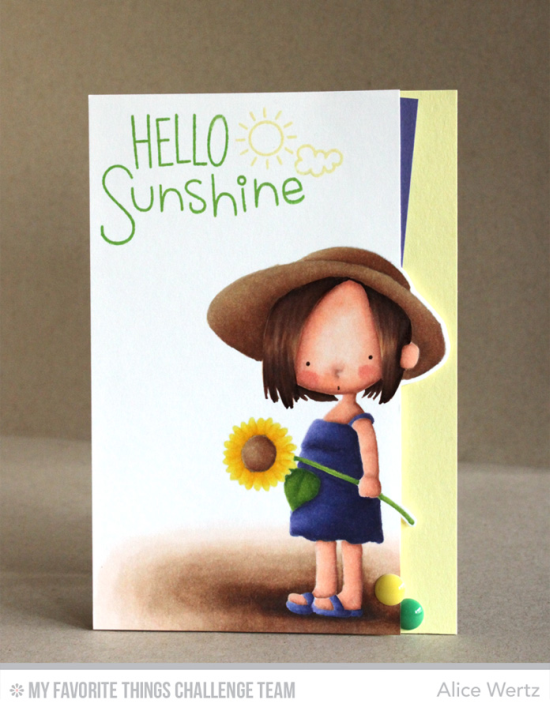 Alice felt the sunshine and created this warm and whimsical card. Erin Lee created a green hill for her two playful bunnies. She added just the tiniest hint of orange in the carrot. Creative license is cool, and just LOOK how the carrot that they are sharing stands out. 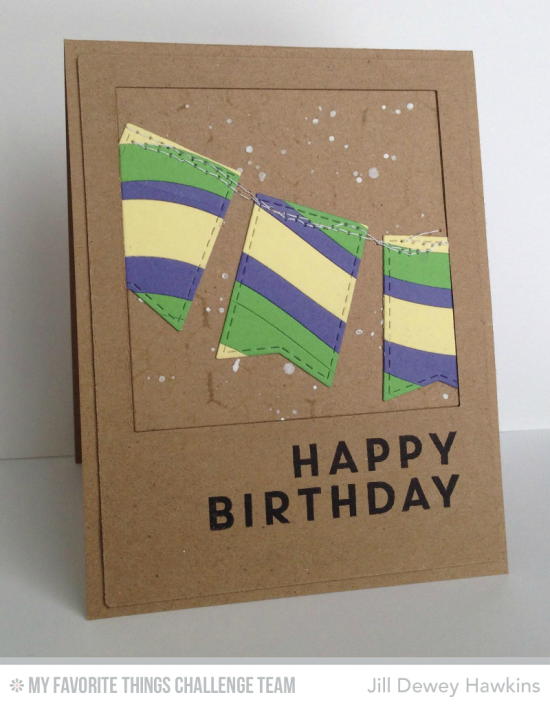 Jill concentrated her colors on focal point flags all layered on top of the neutral Brown Paper Bag. 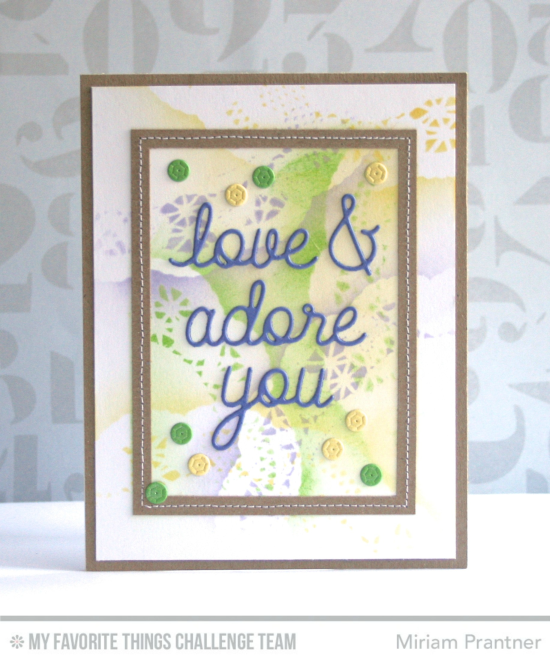 By using a doily as a stencil, Miriam showcased the colors in her background and added a die-cut sentiment and sequins. Brown Paper Bag serves as a frame to this artistic design. 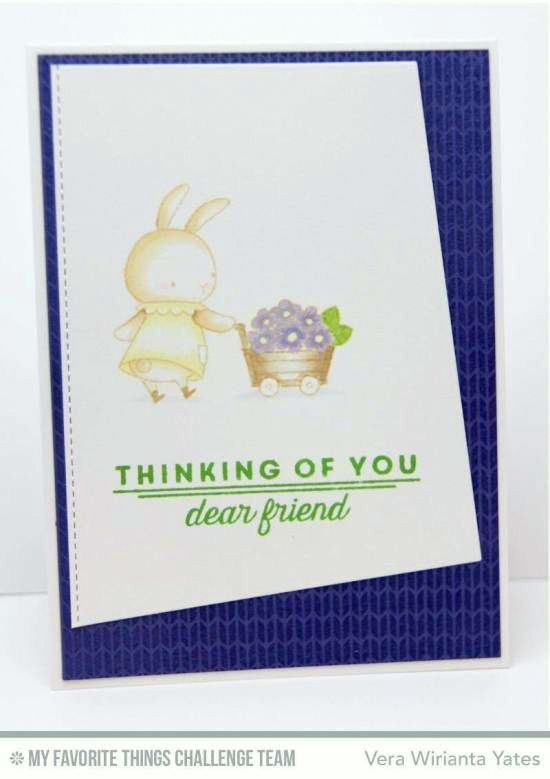 Vera chose Lavender Fields as a bold background for the sweet bunny bearing a wheelbarrow full of posies. Notice her expert shading beneath the bunny and wagon grounding the characters. Fresh flowers take front in center in this stunner by Veronica. There's just the slightest hint of Lavender Fields making those two buds pop. The twine tied at the mouth of the mason jar adds the perfect homey touch. Congratulations, Lee Anne! You are the randomly selected winner of the MFT Color Challenge. You can view all the entries from the last challenge HERE. You have until Wednesday, March 11, at noon EDT to add your link and be eligible for the prize of up to $20 in MFT Cash. Winners are chosen at random, so everyone has a chance! The prize is a $15 Gift Voucher to My Favorite Things, but if you use MFT stamps and/or dies in your project, you’ll receive an extra $5. We're eager to see what you create with this lovely color combination! Oh my, lots of pretties!!!! Great color combo! Oh my gosh! I just checked my email and saw a gift card from MFT and wondered who in the world sent me a gift card! Thank you so much! Very excited! my word! What awesome cards. 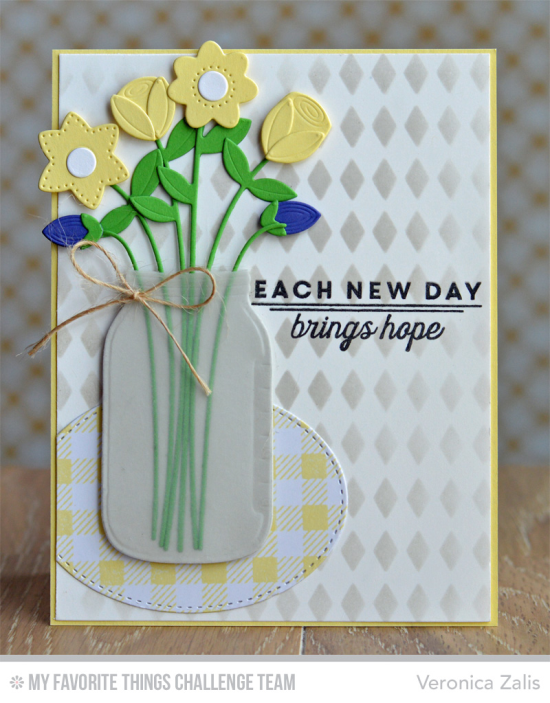 Love the springy new color combo! Thanks for the sweet comments on my blog, Susan!